A few days ago I decided to sell some old coins I had found deep down in a drawer. It turned out the old collectibles were worth about $5 - not that great. But the expert in the coin store told me he would sell these coins to a guy who bought all of those particular coins. My theory is that this guy will try to buy all of these almost worthless coins, and then melt down all of them - all of them except for one coin. This last coin will now be very rare and thus very valuable because of the supply and demand effect. But what about the art market - like paintings and sculptures. Why are some paintings very valuable while other paintings that might look similar are almost worthless. We can can't apply the supply and demand effect here because almost all paintings differ from all other paintings, so we can't generally buy all paintings from one artist and destroy all of them except for one. It might work if the painter is a famous artist - but what if we are stuck with a painting by an unknown artist? 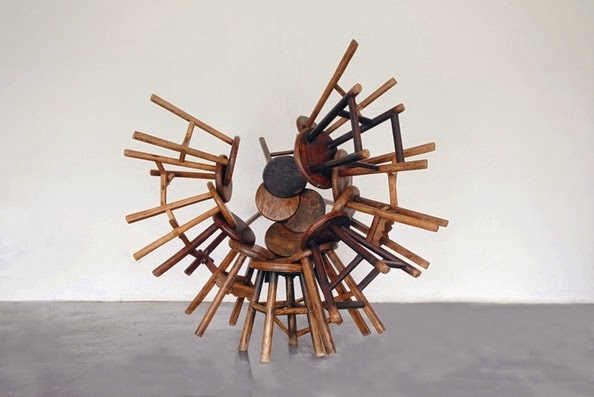 Why are these stools by Ai Weiwei worth at least $500,000? It's not because of a potential future increase in the price of the art - because in the long run your investment in art may only do about as well as your holdings in bonds. And art comes with greater risk.